Why are we winning or losing? How often do we win against competitors, or in the enterprise, or in the healthcare vertical? The answers to these questions are crucial to understand how to build a successful business and improve across sales, marketing, product, and services. How do you gather and analyze this data? Let’s dive into what a win / loss analysis is, how to calculate your win / loss ratios, and best practices for cutting the data to discover insights for improving those win rates. A win / loss analysis is the process of gathering, measuring, and evaluating how many sales opportunities a business wins or loses and why. A win / loss ratio is calculated by dividing the number of won sales deals by the number of lost sales deals. 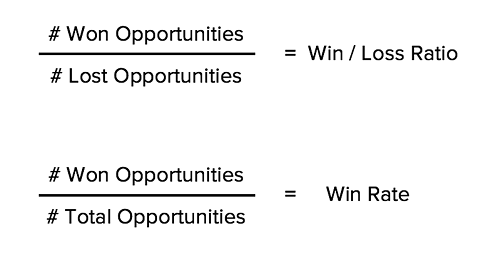 Alternatively, to calculate your win ratio, divide the number of won sales opportunities by total sales opportunities. 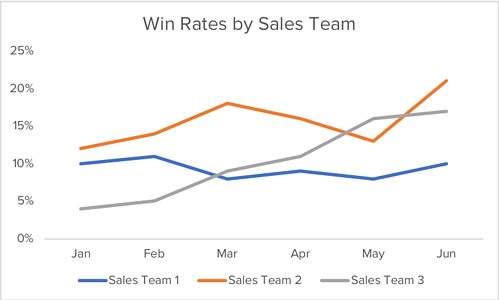 Win rate allows you to see how sales activity - total potential deals - is turning into paying customers. Meanwhile, the win / loss ratio allows you to focus on the deals that are won and lost, excluding the deals that are still in progress. 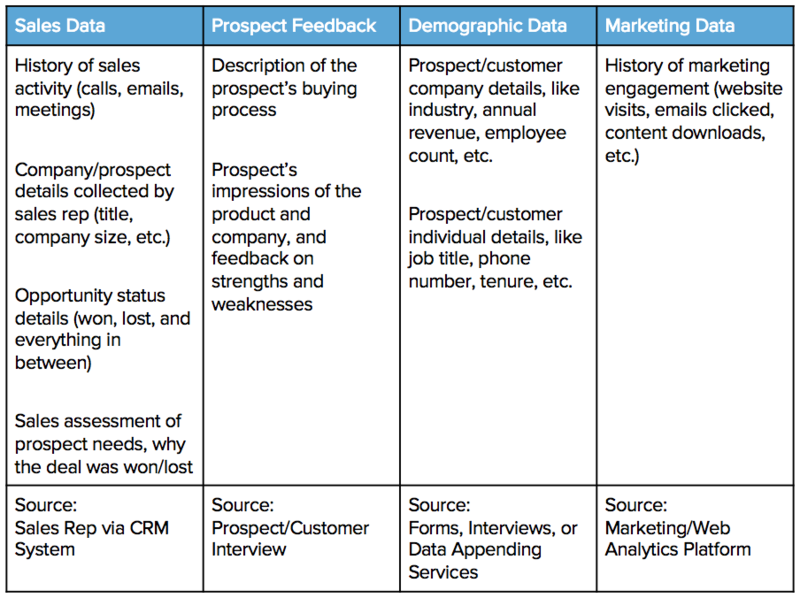 Once you have your data collected, it’s time to dive in and analyze the results. For this analysis, start at the high level - an overall win rate metric for example - and then slice and dice the data based on different factors. Here are a few tips and strategies for slicing and dicing your win / loss analysis. 1. 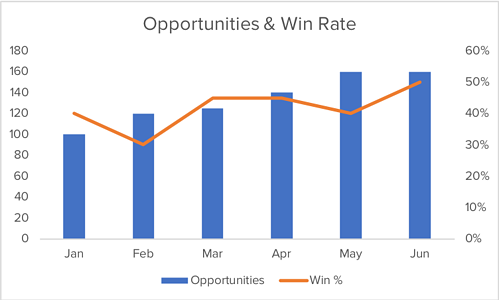 Overall Win Rate: graph the total number of sales opportunities created and the percentage of those opportunities that are won. 8. 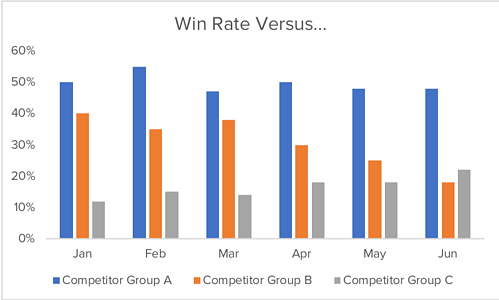 Win Rate by Marketing Activity: see how your marketing can set up a deal to be won or lost by reviewing win rate by the prospect’s marketing behaviors - number of website visits, or specific content downloads, etc. The goal of this win / loss analysis is to uncover actionable insights - trends that can identify opportunities for improvement - and ultimately act on those lessons. Every team that plays a role in winning an opportunity - from sales to product to marketing to services - should review and act on the takeaways surfaced. Sales teams can leverage win / loss takeaways to improve training at the rep or team level. Marketing teams can optimize or launch campaigns to address obstacles in the sales process that are causing losses. Product teams can factor this feedback to focus on product improvements that will help win deals that are limited by product functionality. Services teams can similarly use this feedback to adjust the way they work with customers to address their concerns. Sharing, discussing, and acting on win / loss analyses is critical to turn this process into a competitive advantage. So it's no surprise that many product marketers look at win rate as one of their core measures of success. Companies that implement an effective cycle of feedback and improvement continue to win and surpass others in their industry.